Dr. Micki Berg’s philosophy is that you can let life happen, or you can make it happen. “I Don’t Want To Be Anybody But Me” tells the stories of 13 women who experienced a dramatic shift from a negative to positive self-image in the face of adversity. Their stories are heart-warming, provocative, and eye opening. 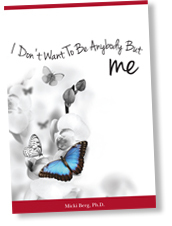 “I Don’t Want To Be Anybody But Me” includes a workbook which provides exercises and tools to help you make positive life changes. This study describes the lived experiences of thirteen adult women who reported a dramatic shift from a negative to positive self-image. The conceptual design of this study is grounded in the philosophy of Gadamerian Hermeneutic Phenomenology, which accounts for the prejudices/prejudgments of the researcher, fosters deep meaning through Hermeneutic Reflection, and often results in a fusion of horizons, which can be transformational for the researcher. Thematic Analysis was the qualitative method used to organize the multitude of data collected from the participants, which produced four major themes: (1) early negative self-image; (2) symptoms/manifestations of negative self-image; (3) early life negative role models; and, (4) Transformation. These themes elicited 16 sub-themes/codes. The process of Gadamerian Hermeneutic Phenomenology, which encourages deep reflection, captured the emotional, psychological, and spiritual essence of each subject’s story of her dramatic shift from a negative to positive self-image. Each participant was asked to describe her life and relationships before, during, and after the shift. Their stream-of-consciousness responses were emotionally charged, and provided a rich source of raw data. The findings of this study revealed a wide spectrum of information, and some surprises, such as the extent to which abuse, both verbal and physical, was attributed to the participant’s family members. A couple of the women reported not only having a low self-image, but having no self-image. Two of the subjects reported early sexual abuse, which led to self-deprecation and guilt. Two others reported being the object battered-wife syndrome. Almost all of the participants admitted feelings of helplessness, hopelessness, and a lack of control over their lives and decisions. Hitting rock bottom was reported by all of the participants. Transformation took various forms, including affiliation with groups like Alcoholics Anonymous and Al-Anon, attending motivational seminars, reading self-help books, therapy, positive role models and mentors. The most reinforcing and profound finding from this study is the message that people do have the ability to recover from adversity and turn their lives around at midlife and beyond. The limitation of this research is the lack of ethnic and cultural diversity of the participants. Not too long ago, I had a conversation with a friend with whom I hadn’t spoken in several years. After bringing her up to date on my six children, I proceeded to describe my present job, the education I was pursuing, and my future career objective. At one point, she surprised me with, “Micki, are you still married?” I was taken aback. I’ve been married for almost thirty-eight years. I asked her why she had asked. “Well,” she said cautiously, “you haven’t mentioned David!” I was elated. In Women’s Reality, Anne Wilson Schaef (1981) proposes that as women, “we must first develop primary relationships with men (or actively seek them) in order to gain our identity and absolution from the Original Sin of Being Born Female” (p.115). I reacted to that concept as being somewhat radical, even ridiculous, and, of course, totally inapplicable to me. My friend’s question made me aware that for many years, I had justified my existence through my marriage. My elation was one of those precious moments of realization. This was most definitely the first of many epiphanic experiences I would encounter in quick succession relating to my definition of myself. I no longer relied on my husband for my identity. When did it happen? I have crossed the threshold into the Female system and discovered a whole new world of opportunity. My friend kept talking, but I was suddenly busy reviewing my life with just two thoughts: You’ve come a long way, baby; and I’ve only just begun. My Grandma Rachel, my Bubba, was unquestionably the family matriarch and decision-maker. Yet, at the synagogue with my Bubba, I first realized my inherent inferiority as a Jewish female. Seated in a curtain-covered balcony, I could only watch the men below pray, sing, dance, and read from the Torah. I accepted this role. When I was fourteen, I heard my aunts sob softly over the death of their mother, my Bubba, from behind those infamous curtains, while their brothers openly grieved among the Rabbis and other men congregants in the main sanctuary of the synagogue. Twenty years later, when I attended memorial services for my father, I knew I had a choice. I chose to worship at a synagogue where women not only sit with men, but are also included in the service. Yet, even today, many Orthodox Jewish women choose to follow the dictates and dogma of old Jewish law, physically and symbolically remaining in the shadows of their husbands. Much of my adolescent and teenage years were spent sitting by the phone waiting for some boy to call and ask me for a date. I clearly remember not having a date for the senior prom and feeling the pain of rejection and embarrassment. As current as 1991, Lillian C. Woo wrote in Women in Change, that “young girls become women who remain dependent on other people’s acceptance and love” (p.22). This probably made Betty Freidan and Gloria Steinham’s blood boil. My continued female dependency and mindless infusion into the White Male System was reinforced by my mother. She strongly advised me to become a teacher, just in case I needed something to fall back on. What I believe she really meant was that I could teach until I found a husband to support me, or, g-d forbid, if I couldn’t find a husband, I would at least be able to support myself. My mother had been an orphan, on her own at age thirteen and subsequently married at sixteen. She preached self-sufficiency and practiced dependency. My rebellion was to major in medical technology. My compromise was that I lived at home during four years of college. It was there that, until the age of twenty-two, I succumbed to my mother’s powerful influence and energy. I felt dependent. I felt safe. I felt taken care or. Being “taken care of” can be a wonderful feeling. I began to feel my responsibility in perpetuating the White Male system, but I called it normal. My first job after college was at The University of Chicago, about a five hour drive from my parent’s nest in Detroit. I finally had a small taste of independence, but within a couple of years, was swept away by my knight in shining armor. I thought I achieved my life-long goal when I walked down the aisle January 15, 1967. Sir Galahad went off to battle Vietcong only seven months after we were married, and once again, I found myself safely back home with my mother. Terrible thoughts punctuated my days. Becoming a young widow filled me with fear, but it was comforting to know that at least I would not end up with the label of “old maid.” The truisms in Schaef caused me chronic discomfort and my solar plexus reacted as though someone far away who knows me intimately is firing those bullets I feared so long ago. My husband returned safely. I produced four sons and two daughters in less than nine years. My husband was proud. I was dedicated to his success. I was grateful for the privilege of being wife and mother. Pursuing other fulfillments would have been deemed selfish. Why would women ever want equality when we could be safe? By the time my children were in school, I had begun to recognize a calling deep with a space that always lodged dead center in my solar plexus. A series of events led me to a career as a trainer. It was through the experiences of this job that I began to allow myself a sense of self-awareness. I slowly discovered that, in spite of what my mother, my husband, my sisters, and society espoused,”self-awareness and focusing on the needs of the self are not the same as selfishness.” (Schaef, p.116). I was not very popular during the early stages of this phase, and it was this lack of popularity that triggered my deepest rage. I was both obsessed and frightened to find out who I really was. Schaef claims that “the only way to get out of depression is to go into it. The only way to deal with rage is to embrace it. In the process of owning our rage, we can accept it, value it, and work through it to the other side.” (p.154). I sank to the bottom through a memorable training experience. Holes were punched in my high-sailing vessel by another female trainer who fit securely into the White Male System. She brought me down and I brought myself up. Officially and literally, I faced my reflection in a mirror, another epiphany, and recognized strength as well as weakness. In a split second, I became fully cognizant that I had choices in how I react to what the actions of the toxic people in my environment. I became aware of Anne Schaef’s words regarding what it means to lose one’s life in order to find it. I claimed myself and crossed the threshold. I wasn’t carried over by my husband as he had so romantically carried me on our wedding day. I stood upright, leaped into unexplored territories and new beginnings. It only took me fifty years. Schaef, Ann Wilson (1992). Women’s Reality: An Emerging Female System. Harper. San Francisco. Woo, Lillian C. (1992). Women In Change: The Psychological Development of American Women. Carolina Academic Press.